The Republican Party’s image, already quite negative, has slipped since last fall. Currently 33% of the public has a favorable impression of the Republican Party, while 62% have an unfavorable view. 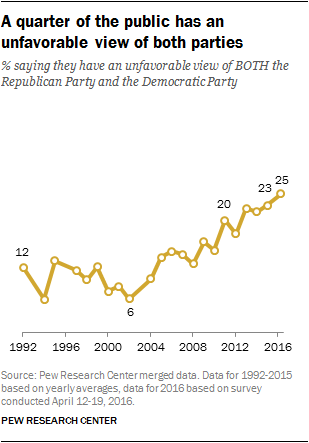 Unfavorable opinions of the GOP are now as high as at any point since 1992. 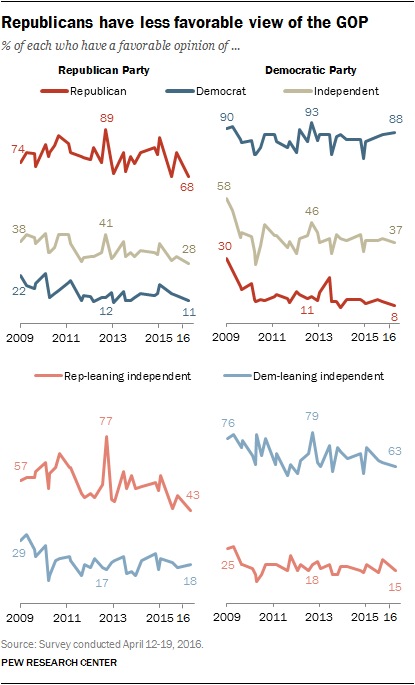 Democratic-leaning independents, like those who identify as Democrats, have much more positive impressions of the Democratic Party. About six-in-ten (63%) view the party favorably, compared with 32% who have an unfavorable view. Overall, a quarter of the public now expresses unfavorable opinions of both political parties. This is driven in part by the growing share of Republicans and Republican leaners who view the GOP negatively, and by the overwhelming shares in both parties who view the opposing party unfavorably. The share holding negative views of both parties is higher today than in previous presidential election years. In 2012, 18% viewed both parties unfavorably and in 2000, just 7% had unfavorable opinions of both the Republican and Democratic parties. Among most demographic groups, more have a favorable opinion of the Democratic Party than the Republican Party. While women are more likely than men to view the Democratic Party favorably (49% vs. 42%), only about a third of women (32%) and men (33%) have a favorable impression of the Republican Party. As in the past, most blacks (79%) view the Democratic Party favorably, while an identical share of blacks has a negative opinion of the Republican Party. Among Hispanics, 56% have a positive view of the Democratic Party; 61% of Hispanics have an unfavorable opinion of the GOP. By contrast, identical shares of whites view both parties favorably (37% each). Among whites, there are sizable educational differences in opinions of the parties. More white college graduates have a favorable impression of the Democratic Party (46%) than the Republican Party (27%). Among whites with less education, 43% view the GOP favorably, while just 32% have a positive view of the Democratic Party.